This project is an operator training simulation for a pulp mill. It is essentially a high fidelity flight simulator for a plant. The Ignition application functions both in a traditional role as the operator interface for the process, as well as being used to manage and track operator training in the form of simulation execution, training scenarios, and performance assessment. The Ignition application itself is primarily an HMI for an entire pulp mill. It spans all main process areas, except for the recovery boiler. The application is composed of 71,512 tags, 107 distinct displays, and 2,333 alarms. Parameterized popups are, of course, used extensively and are available for every motor, valve, and control loop. The training functions are built into the same application and are a straightforward database application with SQL Server as the database. The architecture of the system is very simple; it is delivered as a 5-client standalone system. The process data is provided by an OPC connection to IDEAS dynamic process models. IDEAS is proprietary Andritz software that allows us to build a high fidelity virtual plant. Every piece of field data is an OPC point in the IDEAS model. The model itself is based on a pulp mill which Andritz delivered recently. The training system is set up in a room at the customer site. With the 5-seat license, it’s meant to allow two operators to train concurrently, as well as having one client reserved for a trainer to monitor their progress, provide feedback, and trigger equipment malfunctions and scenarios. Trainees are able to access the system remotely via their corporate WAN. 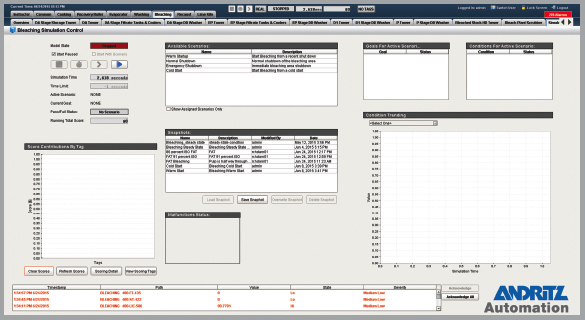 The training component of the Ignition project is a database application, which provides specific functions to control the execution of the process model, save and load snapshots, and run scenarios. In a scenario, the plant is loaded to a particular state. Goals for the scenario are defined in advance (like making a certain quantity of product). Conditions are also provided, such as keeping a particular level above a certain level. If all goals have been met and no conditions have been violated, the operator passes. Records of training are kept and tools are provided to allow for reporting and trainee administration. The training system also tracks financial performance of the process, by allowing cost functions to be applied to measured values. Consumables are a cost, whereas on-spec product is a positive value. Penalties can also be assigned, like fines for exceeding an emissions target. All of these values are integrated in real time to provide the operator with online indication of the profitability of the plant. Andritz has been delivering operator training simulators for many years. However, these simulators generally use an emulation of the customer’s DCS, which is typically very expensive. By creating a generic trainer, operators can be trained on the principles of running a plant at a fraction of the cost of a conventional simulator. This system is also meant to be a generic trainer, suitable for many plants and companies. The same application can be sold multiple times over with minimal modification. We therefore treat it as a product, more than a project. Our future plans for the product are to create similar trainers for other industries, particularly mining. We are also looking at hosting training systems on our servers, to spare our customers the obligation of purchasing and maintaining hardware. Trainees would then connect to the training system via VPN. All aspects of the simulation plant can be controlled through Ignition. 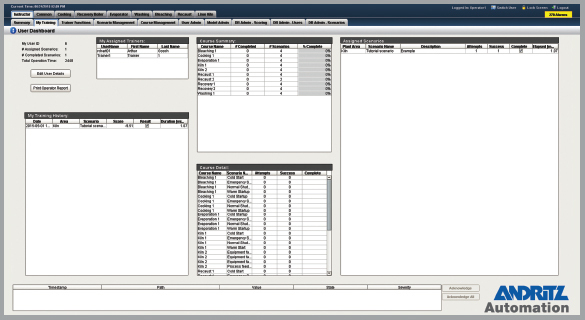 Andritz Automation’s simulation software gives the ability to keep track of user progress. 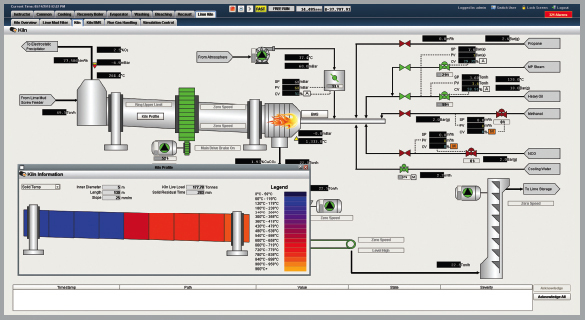 Each simulation plant can be designed to the exact specifications of the live plant.